A player leaving the bench at the end of a game is never a good look. So when Hassan Whiteside was nowhere to be seen following Miami’s 15-point loss to the Orlando Magic on Tuesday night, more than a few heads turned. The Heat currently hold a 9-14 record and are sitting tenth in the Eastern Conference. So it would be fair speculation to assume that Whiteside leaving the bench early may have been because of frustrations with the loss. Especially considering he did not play in the fourth quarter despite finishing one rebound shy of a double-double. But according to Whiteside, he just really had to go. “I couldn’t hold it. My stomach was bothering me,” admitted Whiteside during a scrum with reporters on Wednesday. Whiteside wears number 21, which is fitting because on Tuesday night it was clear that number two became priority number one. He went on to downplay the incident, saying that he has left the bench in order to use the restroom before and that it was simply a case of poor timing. 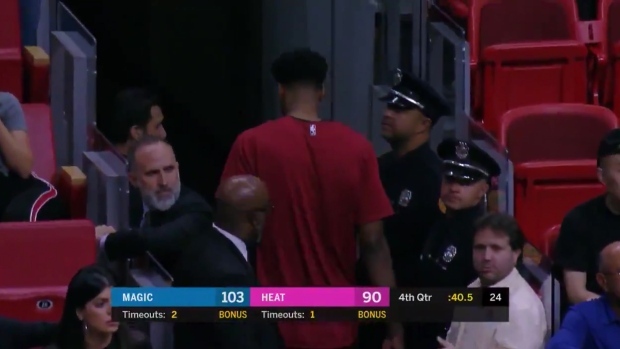 Though, Miami’s coach Eric Spoelstra did not share Whiteside’s sentiment saying, “It’s totally unacceptable behavior from Hassan.” Spoelstra added that the team dealt with it in the locker room. So there you have it. While we may never know or agree on whether it was simply a bathroom mishap or something more, we can all agree that when you have to go, you have to go.